Vanilla flavoured biscuits cut in the shape of cute animals. May also contain egg products, milk products, peanut products, nut products and sesame products. Ingredients: Wheat Flour, Sugar, Vegetable Shortening (Palm Oil) (Contains Anti-oxidant (Ascorbyl Palmitate, Mixed Tocopherol Concentration, Soy Lecithin)), Invert Syrup (Contains Acidity Regulator (Hydrochloric Acid, Sodium Carbonate)), Leavening/Raising Agents (Ammonium Carbonate, Sodium Carbonate, Calcium Phosphate), Salt (Contains Anti-caking Agent (Sodium Ferrocyanide)), Artificial Flavouring, Flour Treatment Agent (Sodium Metabisulphite, Proteases, Amylases), Yeast, Corn Starch. 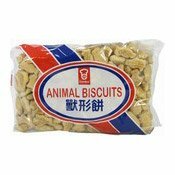 Simply enter your details below and we will send you an e-mail when “Animal Biscuits (Vanilla) (獸形餅)” is back in stock!